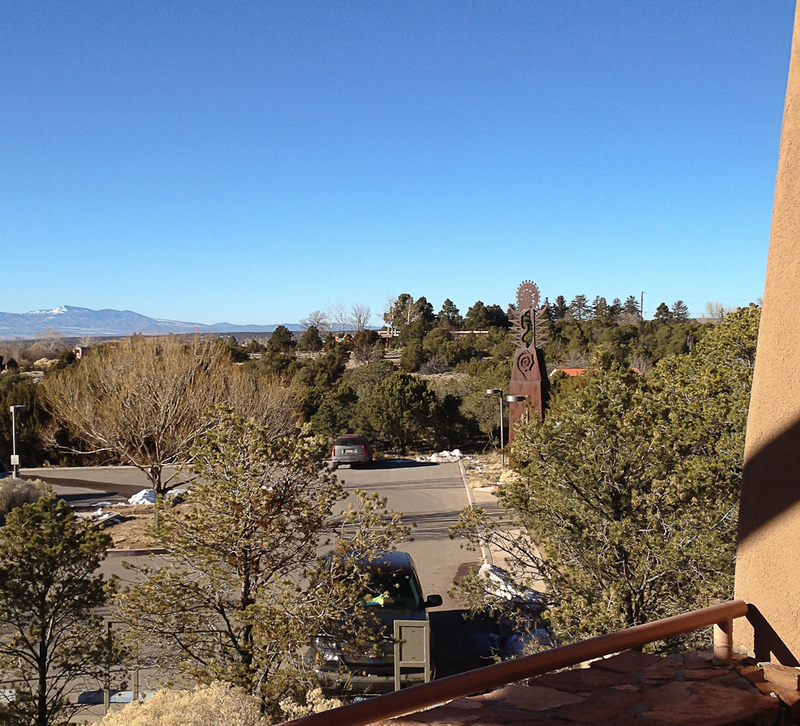 Santa Fe is viewed by many as at the epicenter of red or green chile – chile stews of both colors and made with chicken, pork, beef, or whatever – along with posole, and carne adobado. There is also the ubiquitous green chile cheeseburger which causes big disagreements about who cooks the best. At the same time good barbecue is hard to find. Texan tourists certainly agree with that! Josh’s Barbecue was one of the few oases in the desert even though it was tucked away in a hard-to-find strip mall. The bad news is that Josh’s has closed. The good news is that the Ranch House has opened. This is Josh’s new venue located at 2571 Cristos Road in a beautiful new building complete with great views of the mountains and spacious courtyards for outside dining in warmer weather. 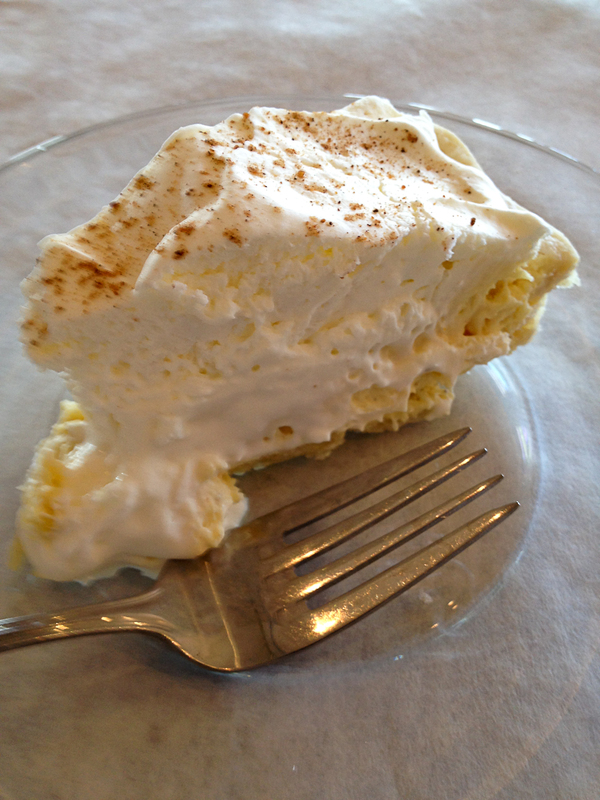 The old-time favorites are still on the menu, but there are some new and interesting additions. There are several dining rooms inside, so don’t be put off by a full parking lot, because you will probably be seated quickly and served by one of the attentive staff. The day we visited for lunch, the place was busy but not crowded. 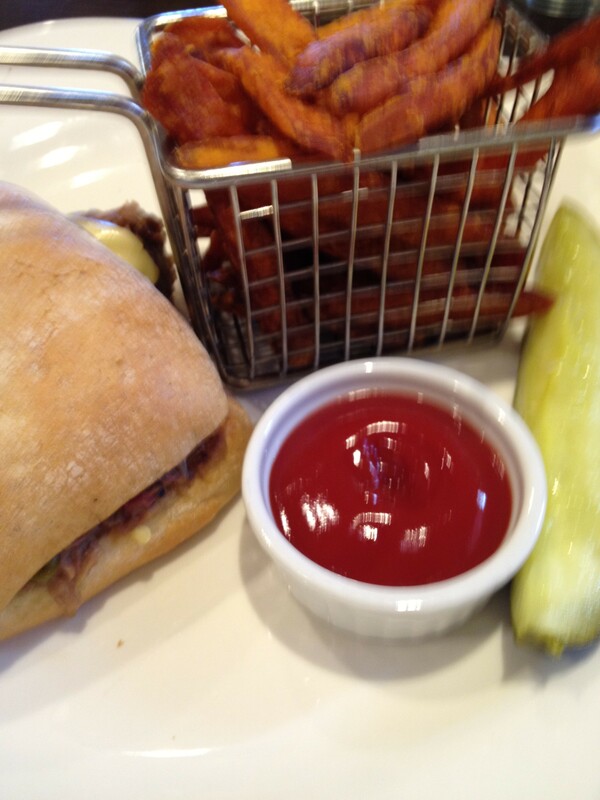 Susan chose the baby back rib plate, and I chose the green chile chopped brisket sandwich – a new experience for me. 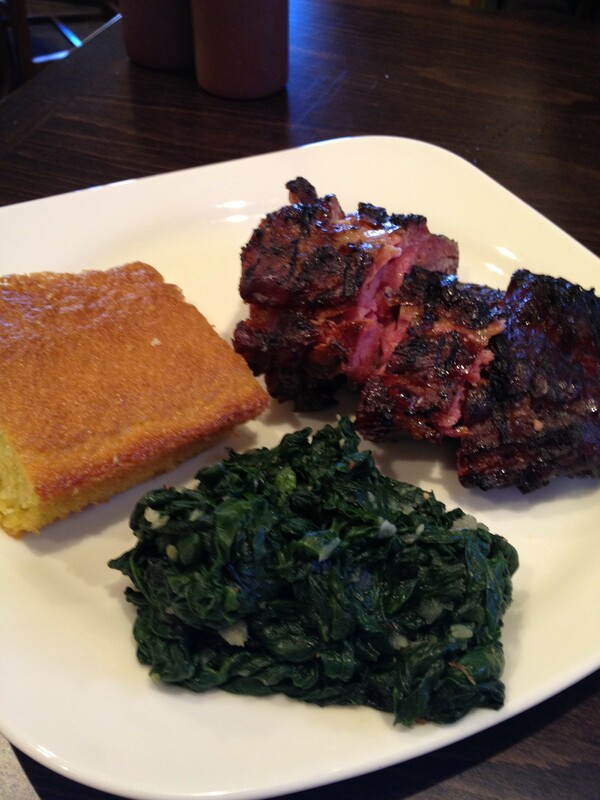 The ribs came with real Southern greens and cornbread with just enough sugar to compromise between Yankees who like sugar and Southerners who don’t. The sandwich was good, too, although I think I prefer either a classic chopped brisket sandwich or an authentic green chile cheeseburger. 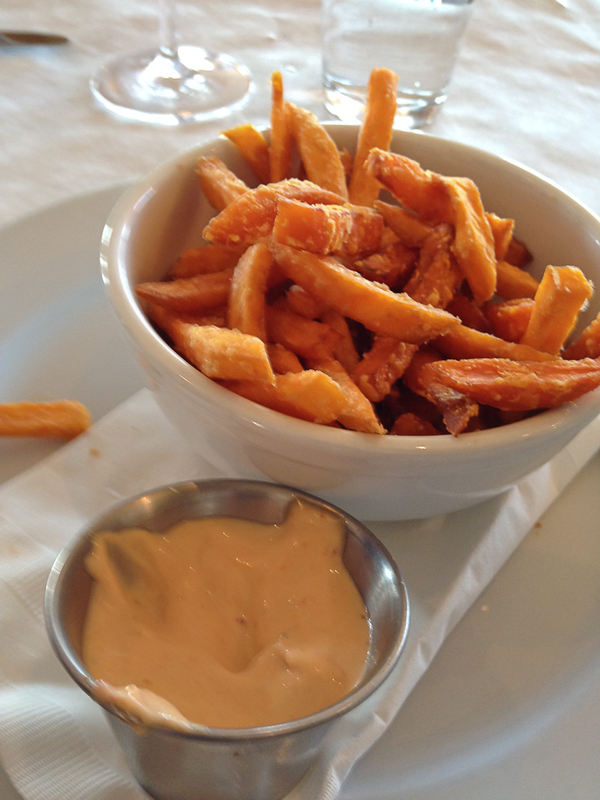 For me, the highlight of the meal was the little fry basket filled with crispy sweet potato fries. The drink selection was good though limited. Lots of beers of course, and wine (who drinks wine with barbecue?) 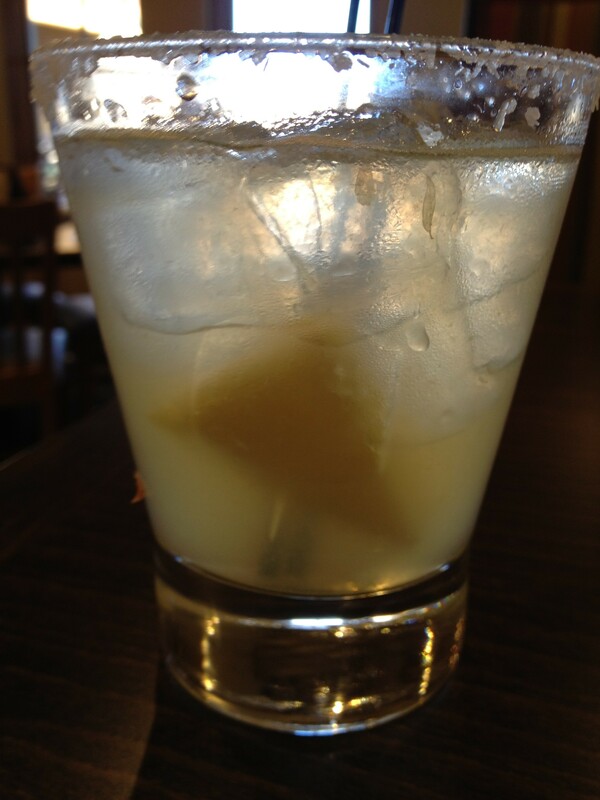 The specialty drinks sounded good, and the pineapple margarita was a hit. The Ranch House is definitely worth checking out if you are a barbecue fan. And who isn’t? Our family has lived in the Southwest for so long that we have adopted many of its traditions. For years we have made tamales on Christmas Eve, and now that is also a tradition for our children and their families, regardless of where they live. Making tamales from scratch is fun, and the fresh, finished product always tastes better than even the best store-bought versions. 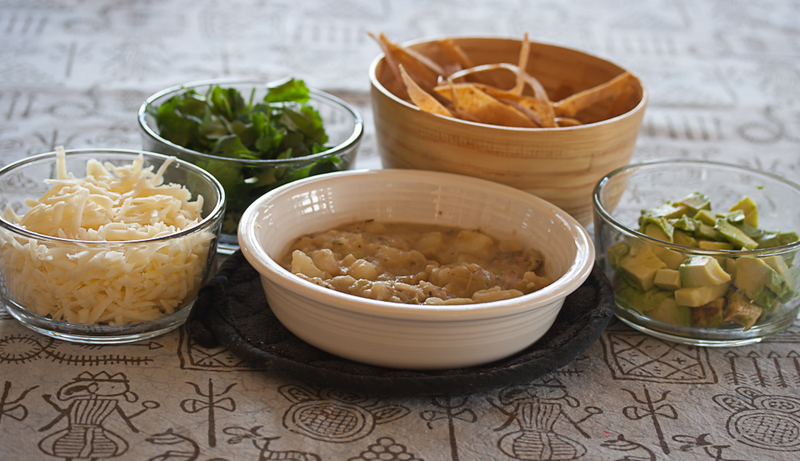 Posole warms the body and the soul on a cold winter evening, and it is perfect for a family gathering on New Year’s Eve. Biscochos (in El Paso) or biscochitos (in Santa Fe) have to be homemade and – like the tamales – have to be made with lard to taste like the real thing. The crisp anise-flavored cookies compete with my grandmother’s anise-flavored German springerle when it comes to dipping into a cup of hot chocolate or a glass of milk. Green chile chicken stew is in a class by itself. A hot bowl always reminds me of long-ago lunches in the lodges at the top of the runs at Taos Ski Valley or Ski Apache in Ruidoso. Our kids always ask for it when they visit us in Santa Fe, and so we try to have a pot on the stove for them when they arrive from a long cross-country drive. Our usual recipe calls for a whole chicken and makes enough for a large group. 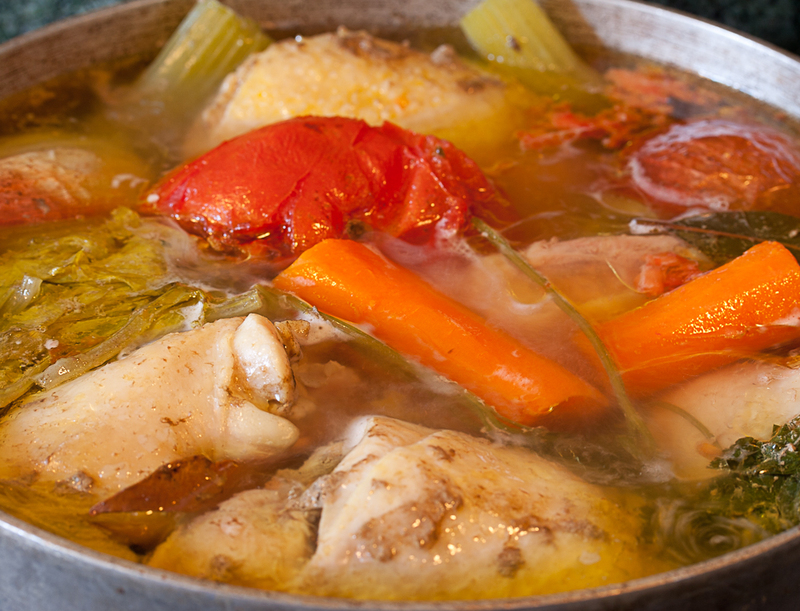 This version is quick, but by cooking the chicken in stock along with vegetables the broth becomes especially rich. If you are in a hurry, just skip adding the vegetables. The recipe makes enough for four adults. It is ideal for the late evening arrival of tired travelers. 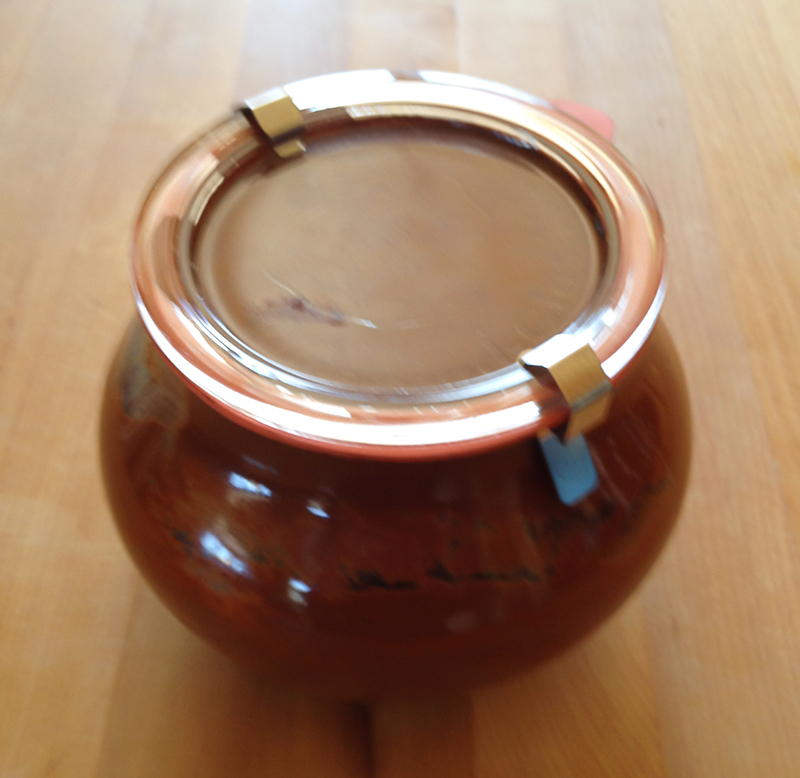 In a large, heavy-bottomed pot, bring the chicken stock to the boil. Add the chicken thighs, onion, carrot, celery, celery leaves, parsley, and peppercorns. Continue to cook at a very low boil for about 45 minutes or until the chicken is cooked through. About 10 minutes before the chicken is cooked, squeeze the Roma tomato into the stock and add the pulp. Remove from the heat. Strain the stock into a container and allow to cool so that you can remove the fat that gathers on the top. Set aside. Remove the skin and bones from the thigh meat, chop the meat into bite-sized pieces and set aside. Clean the pot and return it to the stove over a medium flame. Heat the oil, and then add the diced onions. Cover and sweat the onions for 5 minutes or until they are soft and translucent. Do not allow them to brown. Add the green chiles and minced garlic and continue to cook, uncovered. Stir frequently until the moisture has evaporated from the mixture. Add the flour and stir continuously for about 3 minutes so that the onions and chiles are completely coated and the flour has lost its raw taste. Add the strained, cooled chicken stock and cubed potatoes. Return to the boil, stirring frequently. Continue to cook at a low boil until the potatoes are soft and cooked through – about 20 to 30 minutes. Stir in the cumin, oregano, salt and pepper. Adjust the seasoning with more salt and pepper if needed and continue to simmer for 10 minutes. Add the chicken pieces, simmer for another 10 minutes, and then serve in large soup bowls along with your choice of garnishes. There are lots of traditional choices for garnish. 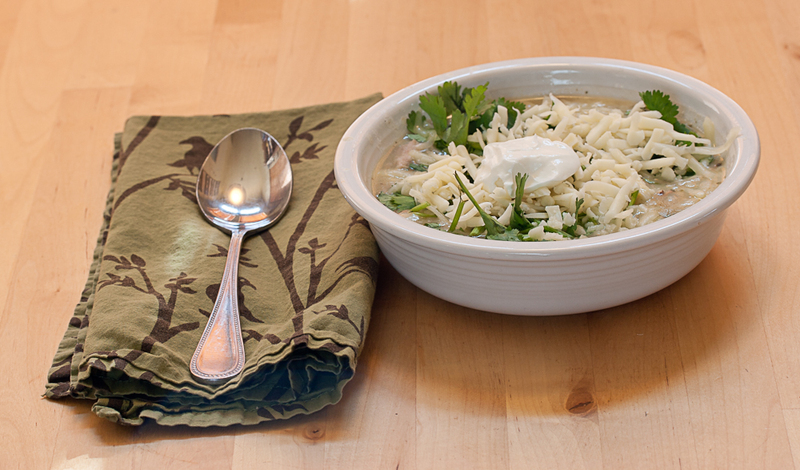 We always like to pass bowls of chopped fresh cilantro leaves, thin-sliced, baked corn tortilla strips, grated Monterrey jack cheese, and diced avocados along with hot sauce for those who like their soup spicier. We also like to serve hot tortillas (corn or wheat) or cornbread fresh out of the oven. The other night we were aware that LSU was playing for the national championship in football. As former Louisianans with direct ties to LSU, we should have been planning a big TV watching party complete with gumbo or that Monday night standby in New Orleans, red beans and rice. Instead we watched an old movie and enjoyed the last of some molé rojo which one of our daughters had sent to us as a Christmas gift. To be honest, we enjoyed the old movie more than watching the drubbing administered by the Crimson Tide, and the molé made a quick meal outstanding. Classic molés have the reputation of requiring many ingredients and a long cooking process. Indeed, Rick Bayless presents his “streamlined” version in his excellent cookbook, “Authentic Mexican: Regional Cooking from the Heart of Mexico,” William Morrow and Company, New York, 1987, pp 201-203. For the recipe, go to the book, but I thought it would be interesting to provide the list of ingredients. The process involves many steps. Clearly, the real thing is a labor of love and considerable skill. If you can’t or don’t want to go to all the trouble, bottled versions are at hand. But you will have to be satisfied with second best. Still a handy jar serves as the basis for a quick meal. 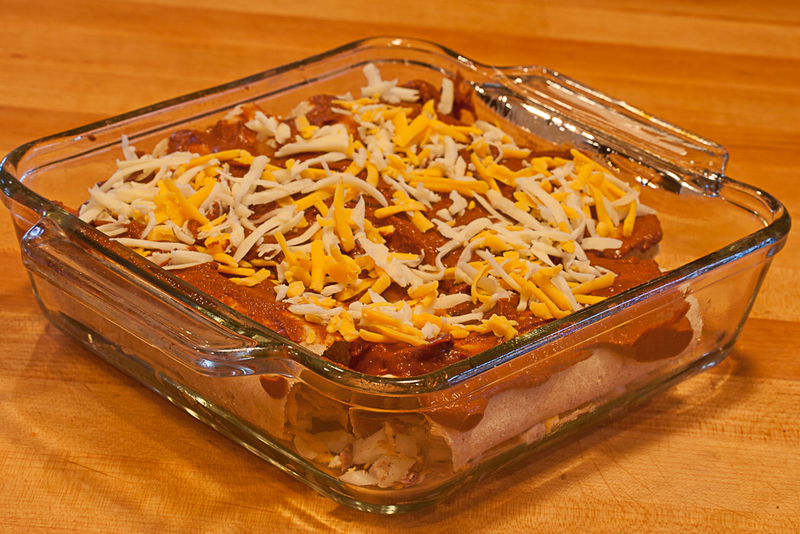 Here is my version of quick chicken enchilada casserole – certainly not authentic – but a good supper dinner for a chilly winter evening. 1. In a medium sauce pan, place chicken thighs in the stock, bring to a boil, reduce to a low boil, and cook for 30 to 40 minutes until the chicken is cooked. Strain the stock and reserve for another purpose. Cool the cooked chicken, remove the meat from the bones, and chop coarsely. 2. In a medium mixing bowl, combine the chicken, oregano, cumin, cheeses, and onion. Adjust the seasonings with salt and pepper. 3. Meanwhile wrap the tortillas in aluminum foil and heat for about 10 minutes at 180° in the oven until soft. 4. One at a time, fill the tortillas with the chicken mix, roll, and place seam-side down in a greased 8 x 8 inch baking dish. 5. When you have filled all of the tortillas, cover them with the molé rojo, sprinkle with the remaining grated cheese, cover the pan with aluminum foil and bake in the middle of a pre-heated oven at 300° until the enchiladas are completely heated and the cheese has melted. 6. 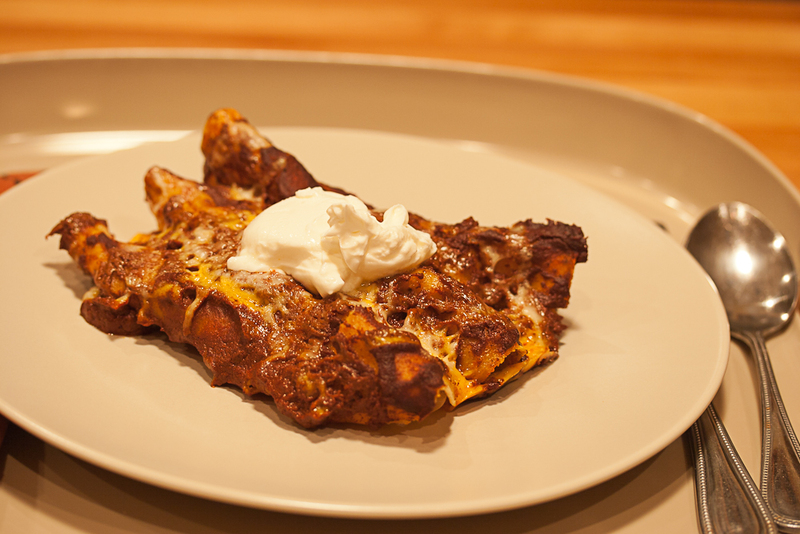 Serve immediately with a generous tablespoonful of sour cream.